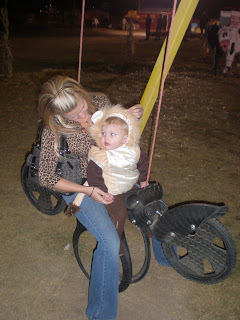 This was Griffin's secong halloween and it was a blast! 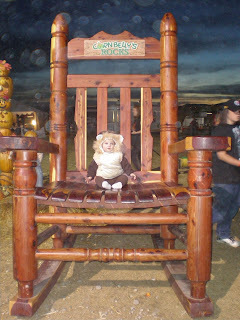 We went to Cornbellies and did the haunted hay ride & corn maze and eat really yummy fried food. 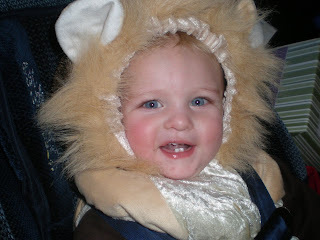 Griff was a lion for halloween and we almost has him saying roar...and by almost I mean not really. Every time I would ask to to "ROOOAAAARRR" he would say "quack"...I should not have laughed so hard the first time he did it becuse he did everytime after that and laughed and got that mischievious look on his face. It was cute! Here is my happy lion cub, in his favorite place...his car seat. He finally got some teeth!! I was wondering hen they would make their apperence. He did not get his first tooth until he was 11 mos old and the other 5 took their time. More comming I am guessing, from the super fun tantrums we have had over the last week! 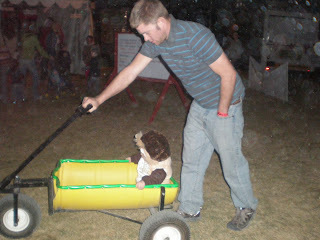 At Corn bellies they have little wagons shaped like ears of corn. He thought it was really fun to his daddy to pull him around, but it made Steve nervouose to pull it behind him where he could not see his "little buddy". He is so funny. That is why is decided to push the wagon and watch Griff the entire time. They had tire swings that were all shaped like different things. We decided to ride on the motorcycle one. Lunch Box was not as excited as I thought he would be but I think he liked it for a second. He is much happier if he is running around...but mommy liked it! Later that night we had our Army friend & all of their kids over. (we are the only couple in our group of friends that is not in the army.) We played games and passed out candy. Scott & Joanne came by for a while to, followed by Brendan & Jack. So we had a full house. Mom could not be there because she was off to Colorado volenteering for McCain & Palin. All in all it was a fun halloween! Holidays are so much more fun when you have kids! Now I am getting excited for Thanksgiving in Shelley!